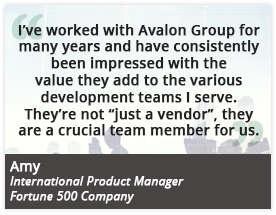 At Avalon Group, our values are central to all we do. Quality: No matter how big or small the project, we complete internal quality checks to ensure our deliverables exceed your expectations. We’re used to working in regulated environments where quality is key to success. Efficiency: In all we do, we focus on working smart and not just hard. For each project, we conduct a needs analysis and devise the best solution. Problem Solving: We’re in the business of solving problems. Instead of starting with a preconceived set of solutions, we work to understand your environment, quality systems, and processes, and propose unique solutions as we understand the landscape.